By now I'm sure you've all heard about Martha Stewart's latest venture into the yarn world, right? Lion Brand Yarn has come out with a full line of Martha Stewart Crafts yarn and a Knit and Weave Loom. Because I've designed for Lion Brand in the past, when the new yarns were going to be released, I was fortunate to receive a sampling of the yarns to try out. I make dolls. It's just what I do and what I think of first when I get a big box of yarn. When said yarn has the name "Martha Stewart" on it and the colors are reminiscent of Martha's understated and sophisticated style, how could I not make a Martha Stewart doll? Then there was the glittery eyelash yarn, in the perfect color for making a chowchow, which just so happens to be the breed of one of Martha's most famous pets, Genghis Khan. Long story short, I made a Martha, wrote out a pattern, and shipped both off to Lion Brand. Little Martha made her way to the real Martha, who invited me to come out to New York and be on the show featuring projects and handmade gifts made from her new yarn. 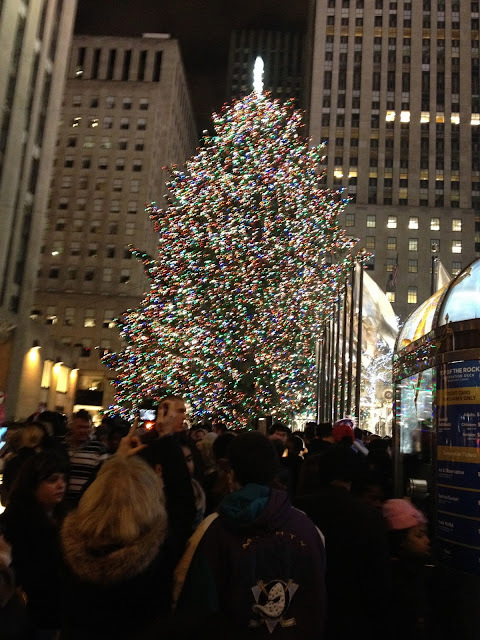 Having never been to New York, I was thrilled! I visited surrounding areas when I was younger but had never ventured into the big city. My husband Paul and I booked a trip and we were on our way! 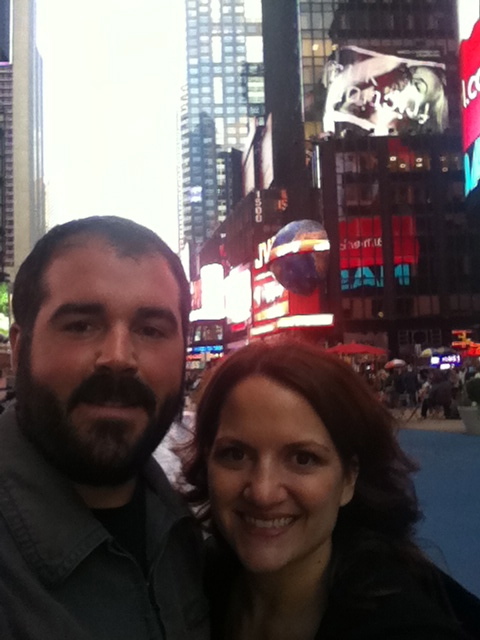 We arrived at our hotel and got checked in, then took a walk around the corner to Times Square. It was surreal to be somewhere you've seen so many times on TV! It was so crowded! A little shopping and then some great Italian food at a little cafe on a side street, then more shopping! Macy's -- and I could barely stand still for the picture! We walked blocks and blocks just to see everything we could before it was time to head back to the hotel. I had an early morning and didn't want bags under my eyes for Martha! The next day we took a cab to the Martha studios. Arriving early, we grabbed a delicious hot bagel and a cup of New York's finest coffee (that's an exaggeration, but it wasn't too bad) and ate our breakfast on the street. The misty morning air wasn't kind to my 'do, but when I got to the studio, I was sent to hair and makeup! I'll give you a little insider secret, too. That doll didn't talk until I got to the studio that morning! I'd made a recording on the little device but it just wasn't clear enough for TV. When it said "It's a good thing," it was a little muffled sounding and had music playing in the background. Simple solution: get Martha to record it herself! So that's just what happened! I sat in the dressing room and took little Martha's head off, unraveled the neck and chest of the doll, inserted the new device, and crocheted it back up. It wasn't until the VERY last minute that Martha's head was on. Even during the rehearsals there was a headless doll on the table and little Martha's head was at her feet. Check out this action shot my husband took--poor little Martha's head just waiting for a body! The show went great! I thought Martha was so easy to talk to and so "human" in person. She's an icon, but really in person she was friendly and personable. She complimented my AWESOME shoes (sorry but they ARE sweet shoes), asked me all about Austin, and told me she couldn't wait to put the doll in her grand baby's nursery. How sweet! We took some pictures together with the little Martha and Genghis. My husband and I got some cool gift bags and everyone was so accommodating and helpful backstage. I also got to meet Zontee Hou, who you probably saw co-hosting Lion Brand's fashion show on Martha. You may have also heard her on Lion Brand's podcast, Yarncraft! She was really cool and so great on TV. After the show was over I could finally relax! I wasn't so nervous about being on live TV, but more about finishing the doll in time for the broadcast and getting there in time, etc. Answering questions about what I LOVE to do? Piece of cake! Check out this video of my appearance! My next stop was the Lion Brand Yarn Studio! I was dying to see the store in person, and feel all the LB Collection yarns, and take pictures in front of the famous display windows! 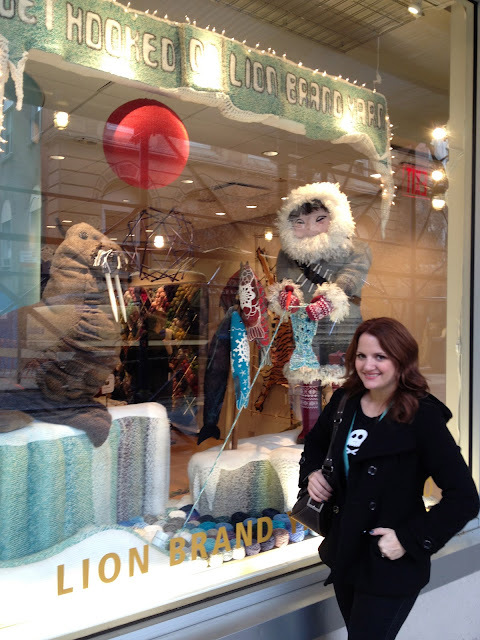 I also wanted to meet Jess, the twitter "face" of Lion Brand. If you follow Lion Brand on Twitter, you've heard from Jess before. The store was awesome! It was a quick subway ride from our hotel. (did I mention how much I LOVED the subway? I think if you live in New York or have always lived there you may take it for granted, but it was greatest thing! So cheap and fast and easy!) We were greeted by the most amazingly adorable window! Here's me in front of the window. Could you just die?? Amazing knit and crochet window! Inside was no less impressive: walls of beautiful, colorful, touchably soft yarny goodness. Jess was as nice as can be and even recommended a delicious cafe nearby for lunch (Cafe Medina--yum!). 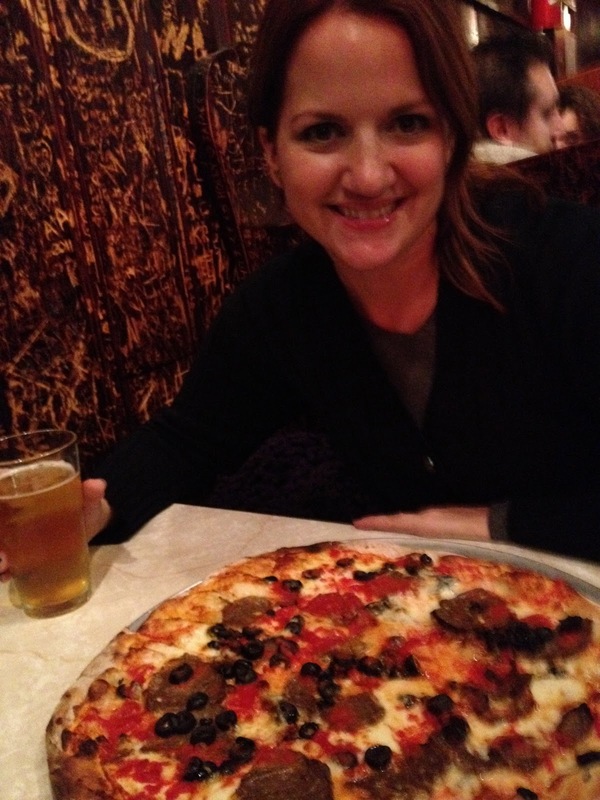 More walking, more shopping, more subway riding, and we ended up in the West Village on Bleecker street for one of the city's highest rated pizza places, another recommendation, this time from my genius agent, and my New York expert, Kate McKean. John's Pizzeria was everything we were hoping to find in New York City Pizza. The place was what you could call a dive, with carved up tables and a HUGE menu of different pizza toppings. We chose pizza with black olives and sliced meatballs. I don't think you could make a mistake with any order. It was amazing. The brick oven baked crust was crispy with burnt edges and hot melty cheese covered the savory sliced meatballs and sprinkling of black olives. The sauce was just right, really tomato-y and not too salty or sweet. Dang, I wish I had that pizza I couldn't finish right now. So more shopping, more subway riding, more walking, and we are back to the hotel. Early morning up and at it again, looking for another great bagel! We went to Times Square Hot Bagel, where I was afraid to order a bagel toasted, so I got a cold bagel with the best cream cheese (strawberry) ever. I'd heard that some bagel places in NY just didn't toast their bagels and you shouldn't ask! Maybe that doesn't apply everywhere. Oh well. It was good anyway, and we accompanied that with a hot cup of Starbucks coffee. It was raining, cold, and what else could have made this last morning in New York more perfect? 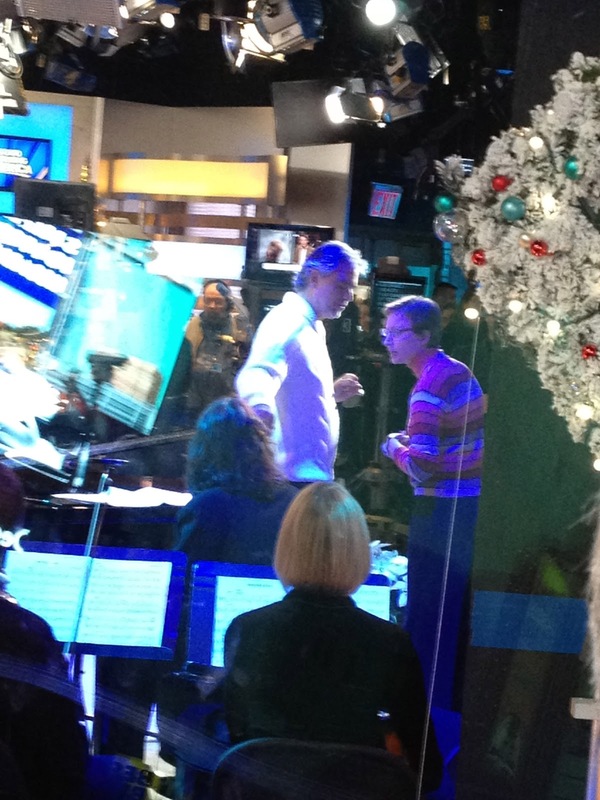 Andrea Bocelli singing Christmas songs just inside the Good Morning America studio. We stood and listened, sipping our coffee and eating our bagels. Perfection. Being our last day in New York, we scheduled a walking tour so we could make sure not to miss anything. This was the BEST THING. If you are going to New York, I would HIGHLY recommend Real New York Tours. Our tour guide was Trey, and we followed him all over Times Square, the Village, downtown and the Financial District, Soho, Chinatown (and its infamous tunnels! 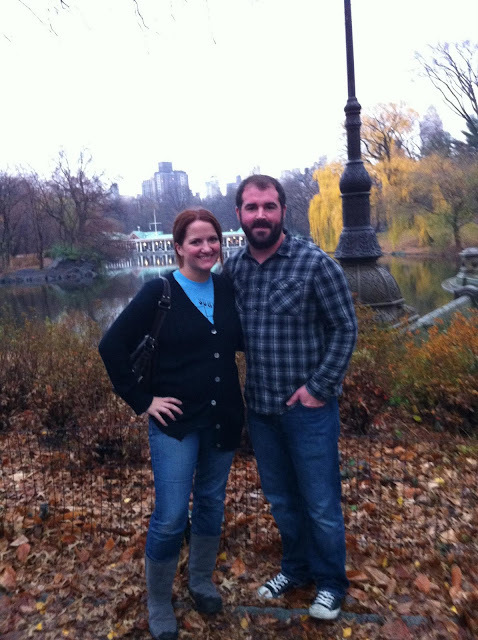 ), Little Italy, and Central Park! We got to see and learn about things we wouldn't have had a clue about if we hadn't been on the tour. He told stories about different events that had happened in certain buildings, told us the history of the different neighborhoods we visited, and explained so much about New York culture. We stopped for lunch during the tour and had the best cannoli EVER at Pasticceria Rocco in the West Village. The tour was so much fun! Shortly after the tour, it was time to head to the airport. It was rush hour and took a while to get to JFK, but we finally made it. By that time, Paul and I were exhausted! The flight back was going to be much longer, over four hours, because of a strong headwind, and the plane was delayed about an hour. It was nothing a couple of drinks at the airport bar couldn't handle, so the wait wasn't bad. Our flight was smooth and easy (another lie, but I digress...) and we finally got back to Texas. I want to thank all the great people at the Martha Stewart show, Jess from Lion Brand, Kate, the people who made the cheesecake at Juniors, Trey from the tour, and my wonderful husband, Paul, for making this dream come true! I was on the Martha Stewart Show! Woohoo! Wow! What an amazing trip. That's so awesome, I'm so happy for you. The Martha doll is so cute and I'm happy to hear how nice she was! Yaaaay! Congratulations on a well-deserved honor. I love the fact that you popped a new sound chip in there at the last second. How freaking cool is that?! @MaDonna -- Thanks very much! Yes she was really nice in person! OMG! That is amazing! What a crazy honor! Tiny Martha made it happen! Your trip to see Martha sounds amazing. What an honor to be featured with her and to show off your work of art. Of course it was super fun to finally meet face-to-face, Allison! I hope you come visit NYC again soon!